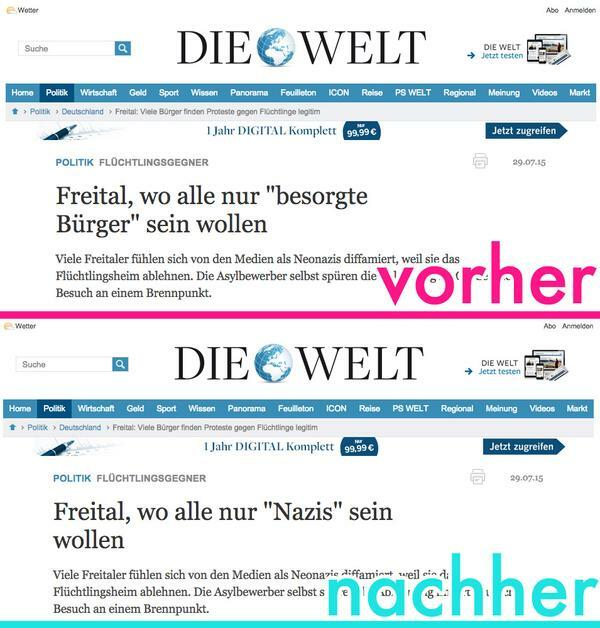 Tante hatte vor einiger Zeit bereits eine Browserextension veroeffentlicht, die „Political Correctness“ in Websitetexten durch „Haltung, andere mit Respekt zu behandeln“ ersetzt. Das klingt grammatikalisch leider gelegentlich holprig, hilft aber ungemein. Nun hat Ole Reissmann nachgelegt, allzu schwache Formulierungen ueber Mobs vor Asylbewerberunterkuenften passend zu aendern. Aus „Asylgegner“ und „Asylkritiker“ werden durch die passende Chrome-Extension „Rassisten“, aus „besorgten Buergern“ „Nazis“. Recht so. Dieser Beitrag wurde am 22. August 2015 von stk in Allgemein veröffentlicht. Schlagworte: rassismus. Coding is not the new literacy – Noch ein Abgesang auf “Code literacy”. Aber nicht aus Prinzip, sondern aus dem verfehlten Fokus auf „coding“. Der sei naemlich analog zum mechanischen Akt des (Hand- oder Maschinen)schreibens. Tatsaechlich sei „Modellierung“ der Knackpunkt – ein Problem in seine Einzelteile zerlegen und algorithmisch loesen zu koennen. Samt Vorschlaegen fuer den didaktischen Ansatz sowohl bei Kindern als auch bei Erwachsenen. Widely-held Opinion (to which I subscribe): There is a huge amount of potential power to be unlocked in non-profits using technology in their quest for positive change in the world. Comic Book Reference, ergo Fact: With great power comes great responsibility. Personal Opinion: As tech projects become more and more widespread at NGOs, and their databases ever larger, we should reflect on whether impact they are likely to achieve will always be positive. Alex, 41, Anti-Gewalt-Coach und zur Hälfte syrischer Abstammung, war zwanzig Jahre lang eine bekannte Figur in der rechtsextremen Szene. Hier erzählt er vom Leben mit Widersprüchen, von der Suche nach Wahrheit und davon, wie die rechte Szene sich die Welt zurecht legt. So langsam wird mir klar: Diese Leute können Dosen nicht einschätzen (nicht die aus Blech, sondern den Plural von Dosis) und wissen offenbar teilweise nicht, was eine Dosis überhaupt ist. Die Vorstellung, dass ein bestimmter Stoff in der einen Menge gesundheitsgefährdend, in einer anderen auf eine bestimmte Weise wirksam ist und in wiederum einer anderen überhaupt keine Wirkung hat, ist ihnen fremd. In ihrer Vorstellung besteht das Fach Chemie aus zwei grossen Listen: Einer mit guten und einer mit schlechten Stoffen, wobei die schlechten auf einer Skala von “eher ungut” bis “diabolisch” sortiert sind. Die Einordnung erfolgt auf Zuruf und tendenziell anhand des Kriteriums “Natürlich” oder “Unnatürlich”. Unnatürliches ist grundsätzlich böse, Natürliches super. Für Mario ist deshalb klar: Wenn man Aluminium (böse) oder eben auch Crystal Meth (diabolisch) zu sich nimmt – egal, auf welchem Weg und in welcher Dosierung – dann ist es zu spät und Tod, bzw. Drogenkarriere sind unabwendbar. Mit diesem pharmakologischen Modell vor Augen reicht dann nachvollziehbarerweise auch die Feststellung, dass in Impfstoffen Aluminium drin ist, um genug Angst für eine generelle Ablehnung von Impfungen zu erzeugen. Max was not a member of Gamergate proper. This isn’t terribly uncommon: Men’s Rights Activists exist who disdain that particular episode, if not for its virulence than for its celebration of men who prefer Dungeons and Dragons to Monday Night Football. Similarly, there are Gamergate activists who remain stubbornly committed to the idea that they are ethicists of video game journalism, wholly detached from „men“ as a generalized political class. But these vagaries — the specific grievances of Gamergate, the sort of person who self-applies „MRA“ versus the sort who prefers some other acronym — are merely symptoms of a broader male sense of victimhood. It is this victim complex I intend to tell you about, not the particular schisms between reactionaries. I am interested in the style of man who makes all such factions explicable. The kind who has in these last decades felt the theoretical foundation of his inherited supremacy begin to crumble and gone into defensive crouch, lashing out at every grain of sand that shifts beneath his feet. Kulturelle Aneignung und Alltagsrassismus im Fasching: warum ich meinen Kindern keine Indianerkostüme nähe. – nachdem letztes Jahr die Kritik an Indianerkostuemen wohl vor allem bei den Eltern nicht so recht durchkam – hier eine elterngerechte Fassung. Die These mit der Namensherkunft via “dreadful hair” auf Sklavenschiffen scheint mir nicht belegbar zu sein (da liegen 200 Jahre zwischen), das Argument, dass der Haarstil einfach kulturell eingenommen wurde, wird davon jedoch nicht weniger gueltig. Dieser Beitrag wurde am 24. Februar 2015 von stk in Allgemein veröffentlicht. Schlagworte: code literacy, Feminismus, impfgegner, mathematik, rassismus, technikfolgenabschaetzung. In Ferguson hat zwar die Landespolizei die martialische Stadtpolizei abgeloest, die Zusammenstoesse gehen aber weiter – nicht zuletzt wegen einer naechtlichen Ausgangssperre in Kombination mit der Erklaerung eines Ausnahmezustands fuer die Stadt (sic!). Also das, wofuer man autoritaere Regimes normalerweise brandmarken wuerde. A Youth, an Officer and 2 Paths to a Fatal Encounter – die NY Times droeselt die Vorgaenge noch einmal auf. Over the years, police departments have given it different names: quality of life policing, community policing, hot spot policing, stop and frisk, neighborhood policing, and zero tolerance policing, to name a few. In the comfort of criminal justice classes and textbooks, these descriptions each have a specific definition. However, in practice over the past 30 years, these tactics mirror one another in their reliance on racial profiling and cracking down on petty crimes and ‘disorder’ to yield the same result: criminalizing the poor, black and brown. Those who champion it should be honest with themselves: it’s not crime they’re afraid of — it’s the black body. Here’s a few other things to worry about. Around every 40 hours a black woman dies giving birth in America — a rate comparable to developing countries without enough modern medical infrastructure. This rate is nearly four times as many as white women giving birth. These were, like Mike Brown, all real human beings with names and families and place they used to live. Playing Soldier in the Suburbs – ueber die Militarisierung von Polizeieinheiten in den USA, und die inflationaere Verwendung von SWAT Units. Autopsy Shows Michael Brown Was Struck at Least Six Times – eine zweite Autopsie wohlgemerkt, die Ergebnisse der „offiziellen“ sind bis dato nicht veroeffentlicht. Dieser Beitrag wurde am 18. August 2014 von stk in Allgemein veröffentlicht. Schlagworte: Ferguson, Polizei, rassismus, USA. Was zum Teufel passiert da in Ferguson? Wenn man sich das obige Video ansieht, denkt man sich vielleicht „Aha“. Oder sonst irgendetwas vermeintlich durchdachtes. Je mehr ich ueber die Augenzeugenberichte zum Hergang der Erschiessung von Mike Brown durch die Polizei von Ferguson gelesen habe, desto groesser wurde meine Wut. Der folgende Text (via) subsummiert das meines Erachtens so gut, dass ich ihn in Gaenze wiedergeben moechte – samt der Empfehlung, den Links zu folgen, besonders zu den Augenzeugenberichten. Alright, i’m gonna sit down and basically explain the situation in this ask so everyone of my followers knows why i’m so pissed. There are several claims from witnesses (see: Dorian Johnson’s account andvideo [HIGHLY RECOMMEND READING UP ON HIS ACCOUNT, ITS VERY SPECIFIC] — Brown’s friend who experienced the situation first hand, La’Toya Cash and Phillip Walker— Ferguson residents nearby the incident), that fall together in generally close claims. However, the only one who’s claim seems out of place is the police officer’s who shot Brown. Who, by the way, is put off on paid administrative leave AND who’s name remained under anonymity for his safety (However, attorney Benjamin Crump is looking for a way to force release his name). He claims that Brown began to wrestle the officer for his gun and tried attacking him after he told Brown and his friend Dorian Johnson (22) to “get the f*ck on the sidewalk”. According to Johnson, after a minor confrontation on the officer’s part where he grabbed Brown by the neck and then by the shirt, the officer pulled his gun on Brown and shot him at point blank range on the right side of his body. Brown and Johnson were able to get away briefly and started running. However, Brown was shot in the back, supposedly disabling him from getting very far. He turned around with his arms in the air and said “I don’t have a gun, stop shooting!” By this point, Brown and the officer were face to face as the cop shot him several times in the face and chest until he was finally dead. Johnson ran to his apartment and by the sound of his account, seemingly had some sort of panic attack. Later he emerged from his home to see Brown still laying in the streets. People were gathered with their cellphones, screaming at the police. According to msnbc, the police refuse to interview Johnson at all, despite his amazing courage to come forward. They didn’t wanna hear it. They only listened to the cop’s account of it all and were vague with the media on what they thought happened. They’ve also refused to commit to a timeline in releasing autopsy results and other investigation information. Now, as of very recently, the media has been banned from Ferguson. There is also a No-Fly zone above Ferguson for the reason of “ TO PROVIDE A SAFE ENVIRONMENT FOR LAW ENFORCEMENT ACTIVITIES ” as said on theFederal Aviation Commission’s website. Cop cars are lined up on the borders to prevent people from entering/leaving. Media outlets are being threatened with arrest. It completely violates our amendments and everything. It’s becoming increasingly scary and difficult to find out whats going on over there. I’m afraid this is all the information I have, though. If anybody else knows anything about the situation, please feel free to add on or correct any mistakes i’ve made as i’m no expert on writing these things. And as a personal favor, i’d really appreciate anyone to give this a reblog in order to spread the word. I think it’s a shame that this is going on in our own country yet so few people know about it. Help me make this topic huge and get this as much attention as possible. Multiple officers grabbed me. I tried to turn my back to them to assist them in arresting me. I dropped the things from my hands. That was when I was most afraid — more afraid than of the tear gas and rubber bullets. As they took me into custody, the officers slammed me into a soda machine, at one point setting off the Coke dispenser. They put plastic cuffs on me, then they led me out the door. We said we were. And the officer said we were both free to go. We asked to speak to a commanding officer. We asked to see an arrest report. No report, the officer told us, and no, they wouldn’t provide any names. Indes gleicht die Stadt einem Kriegsschauplatz. Nicht etwa, weil dort zwei Fraktionen aufeinander schiessen wuerden, sondern weil dort die Polizei mit Material auffaehrt, das Ausruestung und Bewaffnung der „richtigen“ US-Armee im Irakkrieg zu uebertreffen versucht, wie es aussieht (via). Oder weil Al-Jazeera vor Ort ist – und von der Polizei offenbar grundlos mit Traenengas beschossen wird, von ihrem Aufnahmeort fliehen muss, und die Polizei anschliessend die Kamera auf den Boden richtet und „unschaedlich“ macht. Weil wer nichts boeses tut, auch nichts zu verheimlichen hat. Oder so. Auf Boingboing werden weitere Videos und Bilder gesammelt: Polizeieinheiten mit automatischen Waffen, mit gepanzerten Fahrzeugen, mit automatischen Waffen auf gepanzerten Fahrzeugen, die Muendung auf die Menge gerichtet. Yes I did. And I reported it. A call went out for five or six people shooting craps in this alley. I wasn’t the primary car, but arrived on the scene second or third. When we got there, the guys threw dice and money and ran. A white officer chased them. When he caught up with one guy, he grabbed him. The guy didn’t resist arrest, but the officer said, „You don’t make the police run,“ and started beating on him. He was taken to the police station. As I’d witnessed it, I went too. The key to all this is what’s in the report — and the same goes for Eric Garner’s report. They wrote in the report, „D1 (Defendant) struck the C1 (Complainant) without any reason or provocation.“ Now, is that what happened? No. The man was provoked. He was constantly being taunted. Because we were all in the station and the man hit the cop in the face, our policy states that we have to write a statement. Five of us were involved. Four wrote their statements. I wasn’t asked to write one. I did, though, and my statement was different [from] the other four. They lied about the taunting. So now the case is in the system. My statement ended up with the prosecutor. He called me up, and asked me to come down to his office. I went and he pointed out that my statement was different from everyone else’s. I told him what happened, and he said they would have to drop the case because they couldn’t have police officers disagreeing with each other in court. I think the power that police have is not the power of arrest, it’s the power to influence the quality of life of people. That’s how I did my job. The white community tell their children when in trouble, go to the police. Black people don’t do that. We protect our kids from police. At the dinner table … white families will tell children how to interact with the police. They tell them the police are there to help. Blacks do not. My son is autistic and doesn’t drive or speak, so I give this message more to my daughter. I tell her, „If you’re stopped by police, this is the way you have to behave.“ That’s not something white parents need to worry about. Momentan habe ich fast alles von dem, was ich ueber die Vorkommnisse in Ferguson weiss, aus dem (sozialen) Netz, hauptsaechlich Twitter. In den deutschen Mainstreammedien ist bislang nichts zu lesen, die oertliche Zeitung hat bislang auch noch nichts auf dem Radar. Falls das auch in die deutschen Medien schwappen sollte, wird interessant werden, welche Perspektive dort vermittelt wird. Ob zum Beispiel der Bericht Dorian Johnsons und der anderen Zeugen eine Rolle spielen wird, oder ob nur das Statement der Polizei wiedergegeben wird. Haltet die Augen offen. Dieser Beitrag wurde am 14. August 2014 von stk in Allgemein veröffentlicht. Schlagworte: ifttt, Medien, Polizei, rassismus, USA. Was die Polizei alleine nicht schafft – bedrueckende Erlebniserzaehlung einer (gesetzeswidrigen) Polizeikontrolle im Zug allein der Hautfarbe wegen. Der Ältere fragt nach meinen Ausweispapieren. Die Polizisten hatten also vor mir jede Menge Möglichkeiten nach Ausweispapieren zu fragen, aber nein, nur meine Papiere zu sehen, schien anscheinend interessant. Sehe ich so interessant aus? Wie sehe ich denn aus? Meine Haut hat eine Färbung, die als „schwarz“ bezeichnet wird, obwohl eindeutig nicht schwarz. Ich trage ein grün-schwarzes Holzfällerhemd, eine Base-ball-Mütze und habe ein Schal um den Hals. Vor mir auf dem Tisch liegen zwei dicke Bücher zu Mikroökonometrie und Regressionsmodellen für kategorische abhängige Variablen. Murder Machines: Why Cars Will Kill 30,000 Americans This Year. Pointiert geschriebenes Stueck rund um die Geschichte der Verantwortung bei Verkehrsunfaellen mit Kraftfahrzeugen. By the end of the 1920s, more than 200,000 Americans had been killed by automobiles. Most of these fatalities were pedestrians in cities, and the majority of these were children. “If a kid is hit in a street in 2014, I think our first reaction would be to ask, ‘What parent is so neglectful that they let their child play in the street?,’” says Norton. Wieviel Demokratie vertraegt die FDGO? – Lesestoff nicht nur fuer Piraten, die die freiheitlich-demokratische Grundordnung zu etwas Heiligem verklaeren, ganz ideologiefrei, natuerlich. Nach dieser Logik lässt sich jede an Freiheit, Gleichheit und Hierarchieabbau orientierte Gesellschaftskritik, die nicht oder nicht ausschließlich auf die parlamentarische Demokratie, den bürgerlichen National-Staat oder ein kapitalistisches Ökonomiemodell setzt, als extremistisch diskreditieren, ungeachtet dessen, ob sich die Kritiker_innen klar gegen orthodoxen Marxismus-Leninismus, Stalinismus und autoritäre Staatssysteme wie z.B. die DDR positionieren. Der Schutz von Freiheit und Demokratie kehrt sich so in sein Gegenteil. Ausserdem zwei Kommentare zu #bombergate und der, hm, „linkskritischen“ Fraktion innerhalb der Piraten, die mal eben die Partei lahmzulegen versuchen, um ihren Willen zu bekommen: Wer eskaliert hier eigentlich? von Lars Reineke und eine rhetorische Frage von Michael Seemann. Dieser Beitrag wurde am 21. März 2014 von stk in Allgemein veröffentlicht. Schlagworte: Creative Commons, Data Driven Journalism, ifttt, OpenData, Piraten, rassismus, Sexismus, Verkehr. Interessant, dass vor allem weiße Mitteleuropäer Debatten über Rassismus immer total übertrieben finden. Gruseligerweise ist es eine Marionette, die verfügt: „Jim Knopf muss natürlich geschminkt sein, schwarze Farbe oder Schuhcreme, ganz egal!“ Warum das nun? Weil es womöglich nicht genug Schwarze in Augsburg gibt? Weil echte Augsburger unmöglich eine schwarze Hautfarbe haben können? Auf die Beschwerden, warum man sich beim ZDF nach den juengeren Debatten immer noch auf sowas einlaesst (weitergehende Literatur siehe dort), kamen – wie immer – gleich wieder die Apologeten, fuer die die Kritik an Blackface dasselbe wie Rassismus sei, genau wie die Genderdebatte Sexismus und die Sache mit dem Paprikaschnitzel… ach lassen wir das. Ja, die Figur „Jim Knopf“ hat dunkle Haut. Ja, in einer idealen Welt ist die Hautfarbe eines Menschen egal. In dieser idealen Welt leben wir aber nicht. Das ist der Punkt. Der humanistisch gebildete, Menschen verschiedenster Herkunft zu seinem Freundeskreis zählende und in Political Correctness ebenso wie in Fremdsprachen bewanderte deutsche Durchschnittsbürger unterliegt immer wieder dem grausamen Irrtum, Rassismus sei ein Phänomen, das sich ausschließlich im Denken und Handeln Keulen schwingender Neonazis und rechtsextremer NPD-Volksverhetzer offenbart. Dieser Glaube ist genauso falsch wie fatal; da sich kein zivilisierter Mensch den oben genannten Gruppen zuordnen würde, schon gar nicht als Kunstschaffender mit bildungspolitischem Auftrag, können alle folgerichtig niemals Rassisten sein. Dem zugrunde liegt der unerschütterliche Glaube, um rassistisch zu denken und zu handeln bedürfe es eines bösartigen und vor allem bewusst gefassten Entschlusses. Dem ist nicht so. Es hilft eben nicht allein die Einsicht, dass man fast ueberall Auslaender ist, oder die Behauptung, dass man selbst Hautfarbe ja „nicht sehen“ und stattdessen alle gleich behandeln wuerde. Das ist ein hehres Anliegen, und ich kaufe den Menschen, die so etwas von sich behaupten auch durchaus ab, dass sie davon tatsaechlich ueberzeugt sind. Wenn man sich die Bedingungen durchliest, dann fällt als erstes auf, dass Jim Knopf gleich zu Beginn über seine Hautfarbe markiert wird, und zwar ausschließlich. Damit Jim Jim sein kann, muss er geschminkt sein. Damit Lukas Lukas sein darf, reicht es vollkommen aus, wenn er entsprechende Kleidung anzieht. Einmal mehr wird deutlich, dass weiße Haut in Deutschland als Normalzustand angesehen und dadurch unsichtbar wird. Wäre dem nicht so, hätte es auch bei Jim gereicht, eine blaue Hose, ein rotes Oberteil und eine Mütze zu verlagen; Requisiten übrigens, die die meisten Menschen mitgebracht haben, obwohl davon überhaupt nicht die Rede war. Dieser Beitrag wurde am 16. Dezember 2013 von stk in Allgemein veröffentlicht. 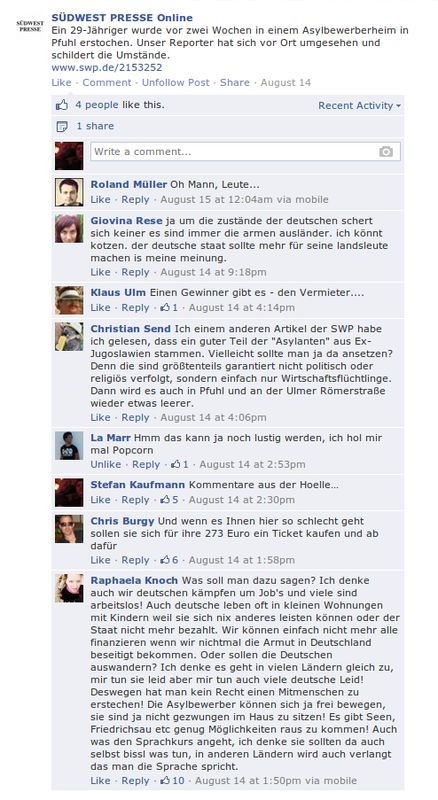 Schlagworte: blackface, Fernsehen, rassismus. 21 Jahre nach Rostock-Lichtenhagen ist es in der Bundesrepublik offenbar immer noch ganz normal und salonfaehig, gegen Asylbewerber*innen zu poebeln. Aktueller Brennpunkt ist Marzahn-Hellersdorf – dort kehrt eine Unterkunft fuer Gefluechtete die ganz dunklen Seiten unserer Gesellschaft hervor. Aus der vielbeschworenen „Mitte“, wohlgemerkt. Es waere jetzt leicht, darauf herumzureiten, dass MaHe ja einfach ein provinzieller Plattenbauvorort im Osten Berlins ist, wo Fremdenfeindlichkeit quasi endemisch ist, eine Ausnahme, wenn man so will. 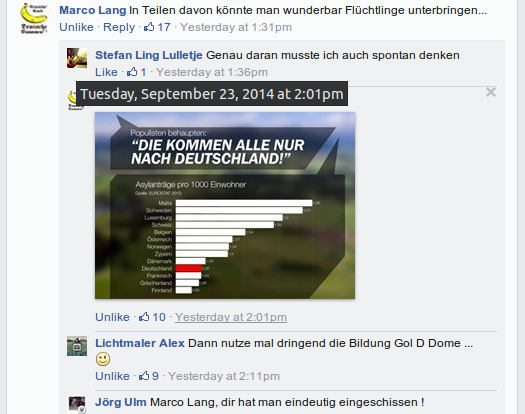 Und dann sieht man aber die Kommentare unter dem Facebook-Link der oertlichen Zeitung, die ueber die Umstaende in der Asylbewerberunterkunft in Pfuhl berichtet, direkt um die Ecke. Und wird sich einmal mehr der bitteren Wahrheit bewusst, dass weder die Brandstifter von Rostock-Lichtenhagen noch die Hitlergrusszeiger von Marzahn-Hellersdorf irgendwelche von UFOs herbeigeflogenen Nazi-Aliens sind, sondern Teile der „Bevoelkerung“, vom Rest weitgehend unwidersprochen geduldet. Addendum, 20.8.: Auf Facebook kam dieser Link zu einer ARD-Reportage herein, wer an Zuwanderern (in dem Fall: Roma aus der EU) so alles verdient. Und zwar nicht zu knapp. Keine Ueberraschung: Durchaus auch die bodenstaendige deutsche Wirtschaft. Addendum, 21.8.: Auf die Frage hin, was man denn selber tun kann: Beispielsweise durch Praesenz und Einsatz zeigen, dass man mit Rassismus nicht einverstanden ist – und dass Leute wie Tine eben nicht „die Mehrheit“ der Bevoelkerung darstellen, der sich nur die ueblichen Verdaechtigen oder „Querulanten“ entgegenstellen, sondern ein breites Buendnis aus der Mitte (oh Gott) der Gesellschaft. In Berlin organisiert man sich unter dem Hashtag #mahe auf Twitter, in Duisburg unter #indenpeschen jeweils zu Nachtwachen, um sich Flaschen- und Sonstwaswerfern entgegenzustellen. Verwandt: Pro Deutschland will am Samstag, dem 7. September, von 0930 bis 1330 vor der Osmangazi-Moschee in der Schillerstrasse und vor den „Falken“ im Ziegellaendeweg demonstrieren. Und die „Deutschlandtour“ der NPD wird im September vermutlich wieder durch Ulm fuehren. 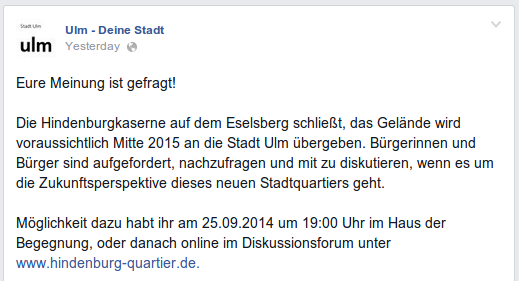 Der DGB Suedwuerttemberg mobilisiert gegen beides. Dieser Beitrag wurde am 20. August 2013 von stk in Allgemein veröffentlicht. 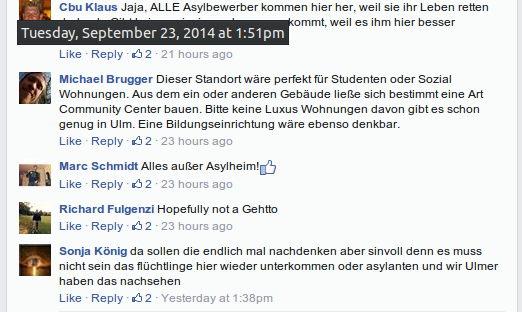 Schlagworte: Asyl, rassismus, Ulm. As long as the German state doesn’t openly and proactively address veiled and open forms of racism and fails to establish and enforce clear legal parameters to explicitly protect its inhabitants from racial discrimination and violence, it will continue to foster a divided society where the rights of people with “conspicuous skin color” can be readily infringed upon. Den subtilen Alltagsrassismus anzugehen ist ein grosses Unterfangen. Wie schwierig es ist, zeigt sich an der aktuellen Empoerung selbsternannter Sprachbewahrer und Anti-PC-Kaempfer bei der Tilgung des Wortes „Negerlein“ aus der „Kleinen Hexe“. Wie es aus Elternperspektive aussieht, seinem Kind beizubringen, dass es fuer einige zur Sprachbewahrung gehoert, so genant werden zu koennen, ist hier nachzulesen. Gegen die weniger subtilen Formen von Rassismus und Deutschtuemelei gibt es derweil ein Projekt von u.A. Lorenz Matzat, das per Karte und Wiki die Aktivitaeten von Neonazis und ihrer Unterstuetzungsstrukturen dokumentieren moechte. Rechtes Land heisst die Datenjournalismuskarte, die inzwischen erfolgreich crowdgefundet wurde. Weiter mitfinanzieren kann man nach wie vor bei Startnext — mehr zum Projekt gibt es bei Lorenz selbst nachzulesen. Dieser Beitrag wurde am 24. Januar 2013 von stk in Allgemein veröffentlicht. Schlagworte: rassismus. Man koennte ja meinen, eine „farbenblinde“ Erziehung, in der Unterschiede zwischen Hautfarben keine Rolle spielen, ja gar kein Thema sind, sei perfekt, um vorurteilsfreie Menschen zu erziehen. Step Two: Actually, that’s it. There is no Step Two. Congratulations! Your children are well on their way to believing that <insert your ethnicity here> is better than everybody else. Dieser Beitrag wurde am 8. Mai 2012 von stk in Allgemein veröffentlicht. Schlagworte: rassismus.